What Determines Good Books To Read For Real Book Buyers? Writing fiction or nonfiction books and hoping they will sell is not a great business strategy, but it is one that is very common. One is to publish for the enjoyment and satisfaction and to be content with some sales and a chance to engage with a handful of readers. To accomplish this, it is quite easy and requires very little investment other than the time it takes to write the book. Very often, it is a matter of wanting to have your say, releasing your story from a bottom drawer or leaving more than footprints in the sand. Personal memoirs, a collection of short stories, local history and real-life family stories might fall into this category. For new fiction authors, it is also a means to test the water to see if it is possible to gain book reviews and some reader attention. Free ebooks are commonly used to find out if a story can gain any traction. Publishing for pleasure as a hobby, or as an experiment, can be very fulfilling. But it rarely produces a reliable income. The second form of self-publishing is to publish a book with the expectation of making a lot of sales, and money. Such a goal needs investment in both time and money to develop a placement and marketing strategy to have any chance of success. In other words, how many people are there that will buy my new book? What percentage of that market do I need to get a return on investment? What are the great titles in the same niche genre and what makes them so attractive to book buyers? Where can I find this information? How can I produce a book that is competitive in the market? In other words, it is deciding to make self-publishing a real income producing business. Publishing a book is easy, but getting book sales is not. Book buyers are fickle. Very often their purchases are driven by name recognition or celebrity status. Think here about bestselling authors such as Dan Brown, JK Rowling, Stephen King or Salman Rushdie. For both fiction and nonfiction, a household name will always have a huge advantage. So also will any book labelled as Pulitzer Prize-winning author, Man Booker Prize, National Book Award or New York Times bestselling. If Taylor Swift wrote a book, it would sell. Would it be a great book? Would it be one of the best books of all time? No, but who cares? She could write about her high school days, and it would sell like hotcakes and readers would add it to 100 reading lists on Goodreads. But a lot of book buyers are genre addicts. For some, it is detective mysteries, World War II, horror or vampires, while for others it is cosy 19th century or Civil War romance. Very few bother with book recommendations other than perhaps a quick glance at the book reviews and rating. It is with this type of modern-day book buyer that self-publishing authors can compete, and for some, do very well indeed. There is no doubt that romance is one of the most popular genres. It can also be extremely profitable if you know how to write for the market. However, most people see romance as the strict domain of women writers. But it is not entirely true. Male writers of romance have had a lot of success. You would probably not associate names such as Harold Lowry, Thomas Elmer Huff, Bill Spence, Peter O’Donnel and Frank Brennan with romance. Would you be surprised to discover romance novels written by Australian men? There is a long list of over 100 books identifying romance titles written by men on Goodreads. According to Electric Literature, the vast majority of gay romances are written by women. So why are men writing romance and women writing gay fiction? Because they are both popular genres and offer a lucrative reading market and gender doesn’t matter when it comes to identifying market opportunities. It is an old business expression – go to where the money is. For many successful self-publishing authors, gender-neutral author names with initials, pseudonyms or genre adapted pen names open the door to writing and succeeding in any genre. The key to making money from self-publishing is to write for readers, no matter your gender. Good authors are good authors. But it means researching what readers buy, and why they buy. One of the most important elements, apart from the story and having a good book editor, is a book cover that suits a certain genre. If you do a quick scan of any genre on Amazon, you will find a distinct similarity between the covers of the bestselling titles. It is because readers of specific genres have an expectation of how a cover should look. Here are a few screen grabs from Amazon from five popular genres. If you scroll further down through each genre list on Amazon you will notice that many poor selling titles have low-quality covers that do not fit as typical of the genre. Another major factor in market research for a new book is finding out what genres readers really buy, and what genres don’t sell very well. Sometimes the success of a book can be as simple as listing it in the right competitive categories and finding associated search keywords. If you are publishing self-help, information about which categories produce the most sales can give you a clear advantage. 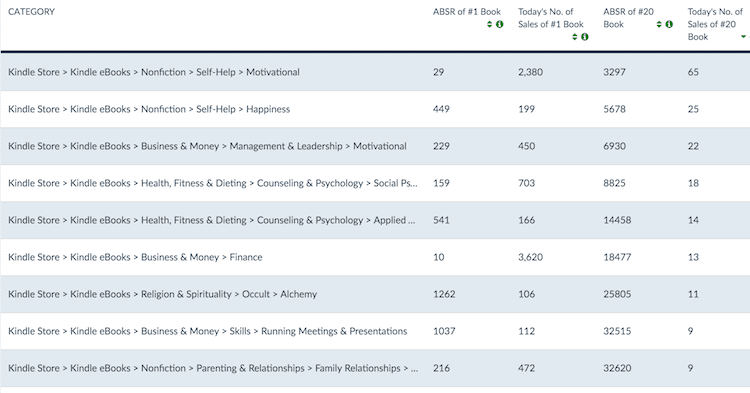 In the example above, self-help>motivational and self-help>happiness are prime categories with 90 sales a day between them. But then you need to find ranking search keywords to complement the category. You can see the best possibilities are motivational quotes, motivational books and motivational books for women to match the category of self-help>motivational. The above example is basic but simple research like this can be done for any genre of book. For a highly competitive genre such as romance, a little research can help position a new book much better on Amazon. A quick look at competitive titles can give you a few clues. I selected a romance title that is ranked at just over #500. Then I scanned the categories of competing titles. 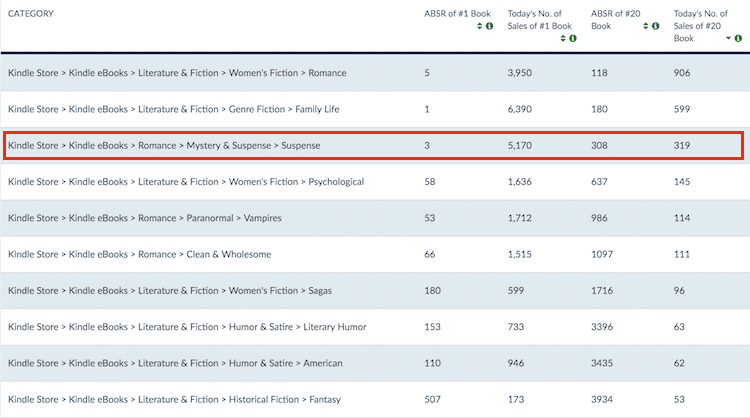 The daily sales of Romance>Mystery & Suspense look the most promising. So if I selected this category, all I need now are some solid search keywords. Trying the keyword sleuth gives two very good romance possibilities. Then using detective for a new keyword search, it gives me four more very good suggestions. The quick research above would help position a new title much better than listing it under the very broad categories of Romance or Contemporary Romance. 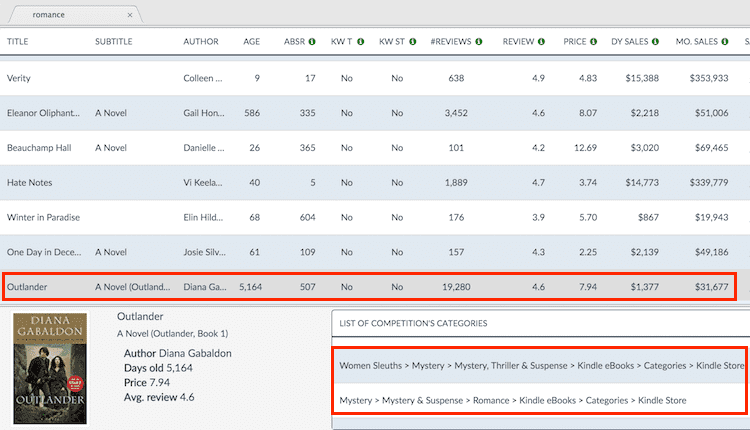 Finding the right niche categories and keywords is the best way to get sales from readers searching Amazon for a new book to buy. It doesn’t matter if the book genre is mystery, poetry, alien gods, horror, native American history or overcoming divorce, there are always categories and keywords that will help position the book for better search results. Doing sound and accurate market research is what can make the difference between success and failure. When you understand what readers think are the best books to read, then you can position and produce a book to suit their buying preference. You can self-publish for pleasure, or for a profit. But if profit is your aim, there is no short-cut to achieving your goal. You have to understand your potential readers and book buyers. What do they want, and how can I keep the customer satisfied? When you can answer those two questions, you are going to have a chance of succeeding. ProWritingAid has published a free ebook for new authors – How To Go From First Draft To Published Author.